Use Urgent Help To Blow Your Rivals Away! Lords and Ladies of Stormfall! We have launched a brand new feature that will allow you to harness the power of your League: League Help. This feature is split into two parts: Building Help, explained in another post, and Urgent Help. Urgent Help allows League Members to assist each other by sending Resources, sending Reinforcements, or sending supporting Attacks to requested targets. Each time you request Urgent Help, your League Members will see your Request in the “Urgent Help” tab of the “Leagues” interface. – Reinforcement Requests: If you are in urgent need of Reinforcements, you can create a Request for additional Units in the “Reinforcement Requests” tab. You can only ask for Reinforcements to defend your Castle. Every League Member is allowed to create this type of Request, although each League Member may only have one Reinforcement Request active at one time. League Members may specify how long they wish their Request will be active for. – Resource Requests: You can ask your League Members to send you Resources. Simply select the type of Resource you require and the amount you need, then create the Request! – Attack Requests: In the “Attack Requests” tab, you can create Attack Requests. 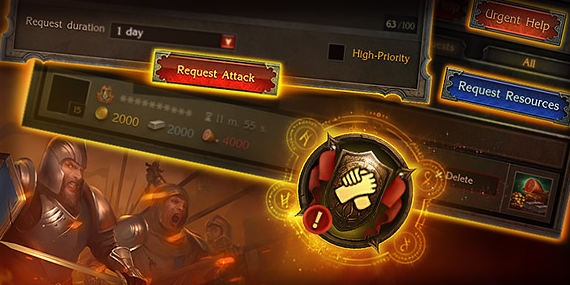 Attack Requests allow you to ask your fellow League Members to assist you by attacking other Castles, Beacons, or League Fortresses. League Marshals are responsible for authorizing Members to create Attack Requests on Beacons and League Fortresses, but all League Members can create requests to attack other Castles. The League Marshal, as well as other League members they authorize, may also give “High-Priority” status to certain Requests, meaning they will be placed at the top of the Urgent Help Requests list. Remember, Lords and Ladies, a chain – or a League – is only as strong as its weakest link. Use Urgent Help wisely!